The past week was a trail for me and my hair because I just could get it to behave. 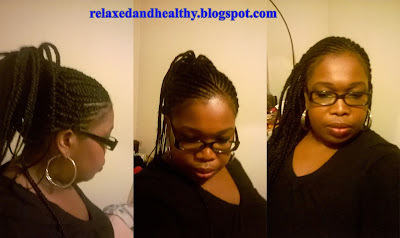 I often have this problem after having in a protective style the hair just does not go back to its normal pattern. So after struggling with it for a week I decided to put back in braids to take me to 24 weeks. 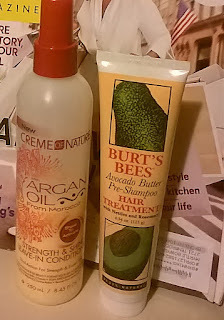 Prepoo- Detangled with warm coconut oil then coat hair from root to tip with Burt's Bees Avocado Butter pre-shampoo Hair treatment before covering with a plastic cap and a head tie before heading to bed. Deep Condition- I did not feel like my hair needed shampooing so instead of rinsing out the pre-poo treatment I applied ORS replenishing conditioner and sat under my conditioning cap for 30 minutes. I then removed the cap and allowed my hair to cool before rinsing with water followed by cool water. After i was finished rinsing I wrapped my head with a t-shirt to remove the excess water. Leave-in Conditioner and Moisturizer- When my hair was 90% air dry, I sprayed with Creme of Nature Strength & Shine leave-in conditioner and Ettenio moisture milk and left to air dry. Once my hair was dry I applied OGX coconut milk anti-breakage serum and blow dry on cool to stretch the hair before heading to the braiding salon. At 20 weeks post relaxer I am super excited at the thickness of my new growth and over all health of my texlaxed hair. At the end of the year I plan on trimming the small portion of bone straight ends. My moisturizing technique worked like a charm on the last set of box braids so I will continue with the same application on this new set. 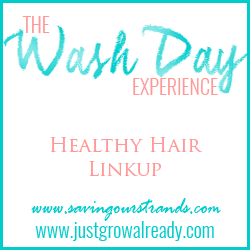 Wash Day- I'm Transitioning !!!! !